Enjoy the lovely lake views at this two bedroom townhouse on the gated community of Mango Key. With the Disney parks just 15 minutes away and the shops of the US192 less than a mile away you are in the perfect place to start your Orlando adventure! Soak up the sun on your southeast-facing patio at this two bedroom townhouse on the peaceful gated community of Mango Key in Kissimmee. Shared facilities include a fantastic swimming pool and spa which overlook the lake at the heart of the community. If you want to explore the theme parks that Florida is famous for, you can reach the Disney parks in around 10 minutes, SeaWorld in 20 minutes and Universal Studios in under half and hour. 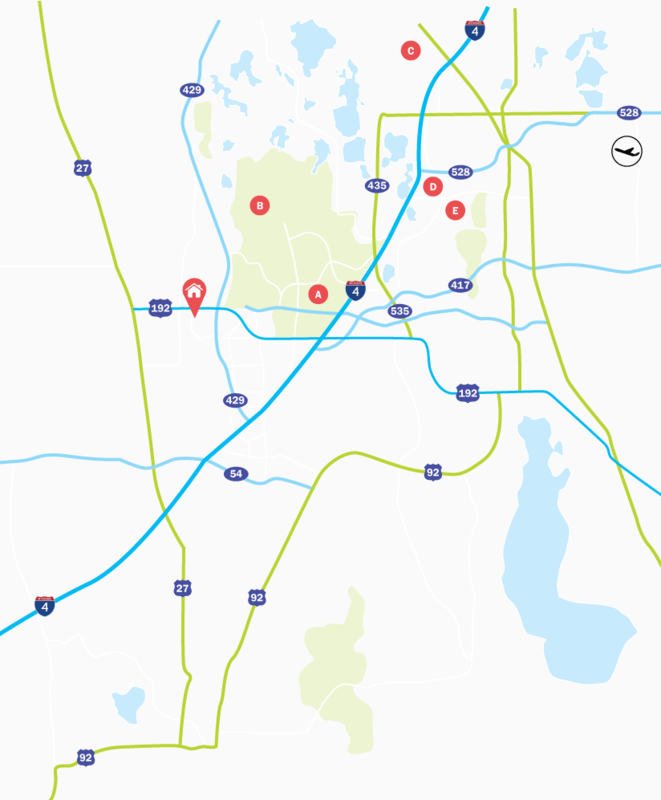 If you don’t want to cook after a tiring day at the parks, stop off on your way home at one of the many restaurants and bars lining the US192, less than a mile from your townhome. Living Accommodation - The kitchen in on the right of this open-plan townhome, and has white appliances and room for two guests to be seated at the breakfast bar. In the dining area behind the kitchen – which has a lovely view of the lake – you can gather around the table which seats four and enjoy a meal together while discussing your plans for the following day. On the left of the villa is the lounge area where guests can relax on the sofa-and-chair seating, and watch a little TV, or use the patio doors to head outside. Upstairs on the landing overlooking the ground floor is a sofa bed. Bedrooms - The Master bedroom is downstairs at the front of the townhome. It has a Queen-size bed and an en-suite bathroom that is shared with the house. Upstairs is Bedroom 2, which has Twin beds and an en-suite bathroom. Both bedrooms have ceiling fans and flatscreen TVs for the comfort and convenience of all guests. Outdoor Living - Outside, put your feet up and lounge in the sun on the southeast-facing patio area. With fantastic views of the lake and fountain at the heart of this community you are bound to want to spend time dining on the table and chairs provided!